You’ve noticed my absence here—I know you have. True, I’ve received only two letters of inquiry: one disguised as a life insurance flyer, the other a blank sheet wrapped carefully around a dead cricket. But I know what that insurance flyer and insect-corpse were trying to say, and I know they spoke for millions of souls impatient for Cabinet news: to put it simply, you missed me. What kept me so busy? Oh, just saving your lives, or at least your sanity. That’s right, you heard me. You’re welcome. And the story can now be told. Those of you who on occasion walk, or hasten, past the Cabinet of Curiosities itself, that strange, many-turreted tower (by the way, I don’t know which of you scrawled “CREEPY OLD WITCH” on the sidewalk outside my window? but it brought a smile and a blush to this old face, as I know you intended)—anyway, those of you who pass by our quarters know that six months ago, a window appeared among the trees. Just a four-paned window, in a wooden frame painted a dingy, peeling white, hanging seemingly from the sky itself. I collected this window several years ago at an estate sale with a tragic history, my favorite kind. 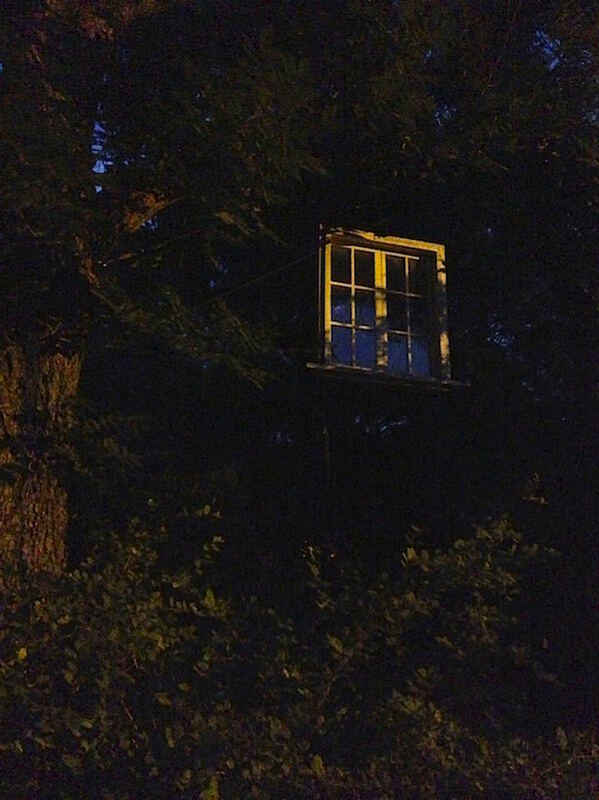 It seems a young couple had hung the window from their trees as a sort of whimsical art statement, I suppose. Artists baffle me; they don’t seem to realize that they are playing with fire. In this case, within about a year, the fire they toyed with burnt them, and badly. This was not a literal fire, for the house still stands. But the fate met by the couple inside was so terrible, so unspeakable, that even years later their once-lovely house bears a tattered FOR SALE sign. I doubt that house will ever sell, as long as human memory lives. I read about the case one morning when the wind wrapped a yellowing scrap of newspaper around our iron gate. When the wind brings a story, you must always pay attention: the wind doesn’t joke. I was profoundly troubled by what I read. Not by what happened to the young artist couple—tragic, etc., naturally, but I don’t care. I have no interest in them. However, according to the newspaper account, when the police and ambulance workers leapt from their wailing, shrieking vehicles, one young paramedic was stopped by a grisly sight on the front porch: a butterfly with one wing torn off, spinning frantically on the ground. I am, as it happens, very fond of butterflies. So I decided to look into this case. I bought the window, brought it home, and hung it among the trees of our front yard. Some know-it-all passerby—was it you? —explained to a friend that the thing must be hung with fishing line or some such invisible thread. Ha-ha-ha, said the know-it-all: it couldn’t just be hanging from the empty air. It could, in fact, and was. But these details need not concern you. Once the window was hung, every night for the next month I climbed into a tree to watch it. I learned that this window has two interesting properties. On nights when the moon is full, when that cold and waxy light spills through the panes—on those nights, and only then, a midnight watcher can see what lies behind the window. The view is not a pleasant one. What lies behind the window are the creatures of our worst nightmares—everyone’s nightmares, the most dreadful ones, the ones you try to forget, and usually do. You know the sort of thing. Skeletons, some still bearing ragged strips of flesh. Shadowy black things leaving trails of oily slime wherever they go. A crowned head, neck still bloody from the axe, eyes and mouth open wide in horror, hurtling toward you. Crowds of ghosts, pale and gray as old photographs, human-shaped but with pieces horribly missing. A snarling dog whose maw is a human mouth that drips blood. A long stream of screaming, flapping night-birds. That sort of thing, and much, much more—all that I saw behind the window on that first full moon last summer. It gets worse. I also learned that on nights when the moon is new, a black disk in the black sky, then all those . . . creatures, let’s call them, that lie behind the window: all those nightmares crowd up to the pane to watch us. And once in a while, at midnight during the dark of the moon, one of the creatures slips or slithers through the window-crack to have its fearful fun, until dawn, when it must return. Do you see what I’m saying? I hope you’re keeping up. That fearful fun of a nightmare is what happened to the unhappy previous owners of this window. “This is a terrible nightmare,” at least one of them must have said, as the terrible, unspeakable things happened. Until he realized, or until she saw, that it was not a nightmare at all, but real as pudding real as a boot, real as a the scream in your own throat. My concern grew. So for six months, at every full moon, I climbed the tree to watch through the window as creatures of blood and darkness fought and cavorted and danced on the other side. And for six months, at every new moon, I planted my old face right in front of that window, so that they would know just who was waiting for them here, and think twice about slithering out. And on the nights when the moon was neither full nor new, I took a single candle and ransacked our curatorial libraries for information. I learned that when by chance the new moon happens to fall on the night of the winter solstice—the longest, darkest night of the year—then the worst of all happens. That night, the window opens, wide, wide, wide, and evert nightmare creature made hard and real comes streaming through, leaving a trail of blood and black slime on the sill. And every house, all that long, long night—not just in my neighborhood, but everywhere in the world where one lies asleep—is visited by one or more of the nightmare crew. And when they are finished, the innocent sleepers are mad or they are dead, and I would not like to have to say which is preferable. And, dear readers, as you perhaps know or perhaps did not, this past winter solstice occurred the same night as the new moon. So I made certain preparations. And on December 21, as the dusk came on, I was already seated in the high branches of our lone evergreen, wool skirts gathered around my ankles. I am an elderly woman, far more elderly than any grandma you know, and I do not wear trousers. But I am an excellent tree-climber, and had at the ready a thermos of tomato soup as warm and red as human blood. I chose the evergreen in order to disguise my presence. I have learned the hard way that when I sit astride a winter-bare branches in plain sight, I risk troublesome neighbors calling 911 to report a “crone in tree” emergency, which leads to the tedious necessity of slipping Forget-Me-Ever potions to the mental health authorities and, frankly, life is too short. Midnight came, and I watched through the window. I saw a nightmare-bat with long needle teeth. I saw a man with a blood-spattered face, a bloodier axe, and a terrible grin. I saw a furry black tarantula the size of a pony with rows of shark-teeth. I saw a sneering doll whose fist clenched and unclenched as it laughed a high, mad laugh. I saw a woman with long black hair whose face was smooth and featureless as an egg. And as the distant church tower gently chimed midnight, I saw these nightmares, and many more, as they lifted the window. I felt the sickening rush of the nightmare wind sweep past me. And what did I have to hold against them, to push them back—I, an elderly woman with an empty thermos and a wool scarf? I had what you use against any nightmare creature: light. At my signal, the sparklers I had tied all over our leaf-bare maple burst and fizzed with crazy light, one after the other, like wild birthday candles. At my signal, in the huge bare oak, the flames of a thousand small white candles awoke and danced. And the Cabinet itself, as if its eyes flew open, lit up in lines and curves and patterns of light, every window outlined in starry brightness, every turret, every gargoyle’s eye and lip, every doorway, every line of every roof, a dazzle of light. It worked, of course. You’re here, aren’t you? The toothed and the bloody and the snarling and the mad retreated, with shrieks of fear and frustration, and the window closed again, I hope for a long, long time. He passed just under my tree, this gentleman. It was tempting, indeed. But in the spirit of the season, I let him live.